When planning your big trip to Florida, you’re probably thinking of the more likely suspects, such as Miami or Orlando – who doesn’t like Mickey Mouse? But if you’ve written Florida off as devoid of history and culture, you’d be mistaken. St Augustine is one of America’s oldest cities, and retains a cultural charm that is distinct from the rest of the state. The city is north of Orlando, near the northern state border, so it could easily be combined with a Disney trip. It’s a bit of a drive from Miami, but, if you wanted to explore all of Florida’s coastline, it could be done. But focusing in St. Augustine, what’s there to see and do? The Oldest Wooden Schoolhouse – over 200 years old, a beautiful piece of architecture. Florida’s Oldest House – while the name might sound a little boring (one could be forgiven for assuming Florida’s oldest house is from the 50’s), the museum and collections actually cover a significant portion of Florida’s history. 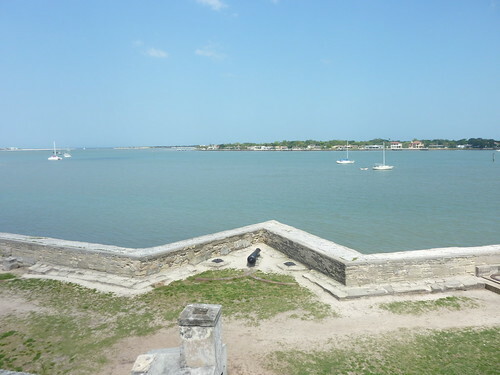 Castillo de San Marco – hard to believe that this old fort was built by the Spanish in the 1600s! There are historical re-enactments on the weekends and certainly a must see if you are here in the area. The first Ripley’s Believe It or Not museum is here in St. Augustine. Called an “Odditorium” (love this word), the building is actually a Castle, so an appropriate first choice. If you’re going to go to one of these, this might be the one to pick. The St. Augustine Lighthouse might not be centuries old, but it’s still an icon of the city, very picturesque, and worth the visit. St. Augustine also has a popular wax museum, and there is even a winery in town! O’Steens: the cheap and cheerful “local” choice for seafood. Their house speciality is the fried shrimp dinner. It is what it is though – no bar menu, no credit cards, and often you’ll have to wait for a table. Yup – it’s that good. Conch House: just outside the main city centre, this is your choice for the best drinks-with-umbrellas in town. But some say they have the best conch chowder in Florida. You won’t know if you don’t try it. Panama Hatties: there’s a huge seating area that has ocean views, and as far as beachside eating, this is one of the most reasonably priced in town. If you’re in the area, St. Augustine is certainly a must see. It’s also well worth the drive from Orlando, if you happen to be there. Been to St. Augustine? What was your favourite attraction?